Spendthrift Obama has gotten himself into some hot economic water exploding the federal deficit to more than 10% of GDP for the first time since World War II. If you fans of Keynes think all that spending has helped the economy you might want to take a look at employment data before you start celebrating. Total Private Employment ( BLS data) is still lower than it was at the trough of the last recession and the lowest it’s been in ten years. 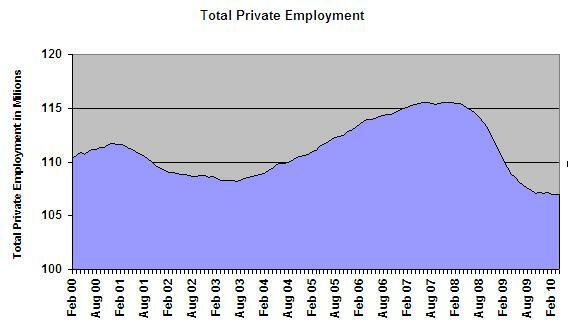 Does this graph look like a recovery to you? But contrary even to Keynesian – so-called wisdom – our fearless leader now is preparing his PR machine to sell us not just on higher taxes but on a new type of tax – a VAT. VAT stands for Value Added Tax and it’s already familiar to Europeans. It’s collected by businesses based on the amount of value they add in the production cycle. This is a terrible idea for many reasons. The Left should hate it too. The VAT is deeply regressive in that it’s paid equally by rich and poor alike. The collection costs are borne by the sellers, and the full tax is paid by the consumer. The tax is costly to collect and to monitor. To avoid the tax, people pay for services in cash. The service provider does not report the sale and also avoids paying income or other taxes. The so-called underground economy grows. Because the VAT raises the price faced by the consumer, spending declines. Discouraging consumption? Come on Keynesians – I thought you wanted to encourage consumption. Stimulus packages designed to encourage consumption and then a new mechanism to tax it? All that does is grow the government’s share of GDP. Hmmmmm. Bailing out financial institutions? Taking over the auto industry? A health care package that nationalizes 12 percent of our economy and puts the IRS in charge of enforcing it? Do I detect a trend here? Passing a VAT not only locks in place the current welfare state in place by financing the increased current and future share of government spending and transfers. The VAT would pay for part of the unfunded liability for health care including the large costs added by Obamacare. Passing a VAT would mean that the unfunded Federal liability would be paid mainly by tax increases with few or no reductions in spending. Earth to Obama – TAXES NEED TO GO DOWN NOT UP. WAY DOWN. To do that you need to reduce spending. You have done enough damage to the economy. We can’t afford tax increases in the middle of the worst recession in 50 years. We can’t even afford to talk about it – do you want to inject more fear and uncertainty into the economy? The talk of a VAT shows that the Obama administration is willing to ignore all logic and reason in it’s quest to destroy the free market and centralize power in Washington. It adds another national level taxing mechanism making an end run around federalism and competition. When it comes to tax policy they can’t afford to give us any choices because they know all to well what will happen. European experience suggests that the VAT is a largely hidden tax that can increase with less political opposition than increases in the income tax. The European welfare state is a main reason that since about 1980 Europe’s growth rate has fallen below the U.S. growth rate, and reported European unemployment rates have been well above U.S. rates on average. The United States should avoid locking the country into a low growth future. The VAT violates fiscal federalism, the tacit arrangement that leaves some sources of revenue to state and local governments. Traditionally, sales taxes have been reserved for the states. VAT, like a sales tax, falls on consumer spending. State governments are a likely source of opposition to a Federal VAT. States and local governments have large unfunded liabilities for pensions and health care, so they will need their sources of revenue. If you thought the health care bill was a disaster the you better prepare yourself for deficit-reduction Obama-style. It’s pretty clear which side of the revenue/expense trade-off he is looking at.